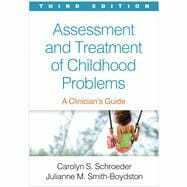 by Schroeder, Carolyn S.; Smith-Boydston, Julianne M.
This highly accessible work, now thoroughly revised, has shown thousands of students and clinicians how to assess and treat children's emotional and behavioral difficulties from a developmental perspective. The authors provide a sound understanding of typical development (ages 2-12) and the risk and protective factors for psychopathology. Chapters on common psychological disorders and family stressors describe the nature of each problem, review evidence-based treatments, and offer step-by-step guidelines for intervention, illustrated with helpful case examples. A comprehensive framework for assessing children and planning treatment is used throughout. Purchasers get access to a Web page where they can download and print the book's 24 reproducible forms and handouts in a convenient 8 1/2" x 11" size. *Significantly revised to reflect advances in assessment, treatment, and developmental psychopathology research. *Additional material on pharmacological treatments in each disorder-specific chapter. *Sibling rivalry chapter expanded to include difficulties with peers. Carolyn S. Schroeder, PhD, is currently Adjunct Professor in the Clinical Child Psychology Program at the University of Kansas. She previously held appointments in the Departments of Pediatrics, Psychiatry, and Psychology at the University of North Carolina at Chapel Hill. Throughout her career, she has trained graduate students, interns, and postdoctoral fellows from multiple health care disciplines in the assessment and treatment of children and their families. She is widely recognized for the establishment of a model for psychologists’ participation in primary care pediatrics. Dr. Schroeder's professional contributions have been honored with awards from the Society of Clinical Psychology, the Society of Pediatric Psychology, and the Division of Family Psychology of the American Psychological Association, among other honors. In 2013, the Society of Pediatric Psychology established an annual award for clinical practice in her name. Julianne M. Smith-Boydston, PhD, is Director of the Child and Family Services Clinic at the University of Kansas, where she has supervised teams of graduate students since 2004. For over 15 years, she worked at the Bert Nash Community Mental Health Center in Lawrence, Kansas, where she coordinated staff development, oversaw all assessments for child and family services, and supervised multidisciplinary community-based teams, psychology practicum students and interns, and therapists in a therapeutic classroom. Dr. Smith-Boydston also held an appointment in the Department of Psychology at Washburn University, where she taught graduate and undergraduate courses. Her publications reflect her interest in evidence-based practices and their dissemination into community-based programs.